I am a 48 year old male and look pretty good for my age. But my neck is starting to sag under my chin. I am trying to educate myself about plastic surgery but most of the TV shows talk about females having plastic surgery. Is there anything a man can do to improve the appearance of his neck, like liposuction of the chin or a neck lift? Plastic surgery is becoming more and more common among men but women still do make up the majority of patients in most plastic surgery offices. We have been doing plastic surgery for 30 years and must say that the popularity of such procedures, in both men and women, is at an all time high. People watch plastic surgery procedures on television, read about them in everyday magazines and feel free to discuss their personal wish lists with friends. In both men and women, during these challenging economic times, comes another incentive to proceed with facial rejuvenation, the desire to appear more youthful and desirable in the work force! When we first began in this field, it was unusual for patients to be so free with their questions or to share their experiences with their friends so readily after surgery. This openness and the availability of vast quantities of information about plastic surgery on the internet have lead to much better informed patients, and fueled both males and females with a desire to look better. In our personal experience, 30 years ago men constituted less than 10 per cent of our practice but today, this number has easily passed 20 per cent. Almost an equal number of men as women seek consultations regarding nasal surgery. Men frequently request information regarding eyelid surgery and facial rejuvenation. And as you mentioned, one of the most common complaints heard from men is a desire to improve neck laxity, often so that a shirt collar is more comfortable or a neck profile could be more pleasing. The desire for liposuction is also popular in both sexes but the areas men request suctioned differs from female patients. Most men have concerns in the abdominal, love handle or chest regions, while the most common area of concern in females is the hip and thigh area. In a nutshell, neither men nor women enjoy looking older or flabbier – those of both sexes who do not like what they see in a mirror feel free to call us. 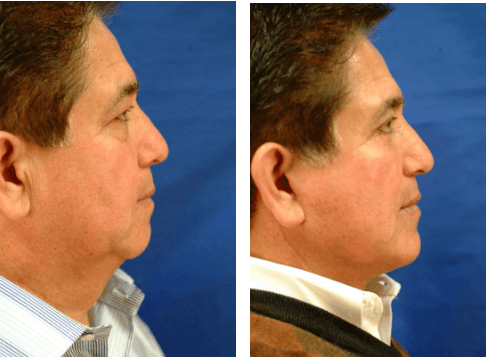 Here are three examples of male patients who wished to have their neck profiles improved. If you have any specific questions about cosmetic procedures, your best bet would be to see a qualified plastic surgeon to review your options. Pease feel free to contact our office at 949-888-9700 to set up an appointment with Dr. Bunkis; you may also check out our web site at www.orangecountyplasticsurgery.com to see further examples of male patients. 56 year old male, before and after neck lift, lower eyelid fat removal and a chin implant. This tightened the patient’s neck line so his collars fit better and improved his profile. This is an actual patient of Dr. Bunkis – your results may vary.